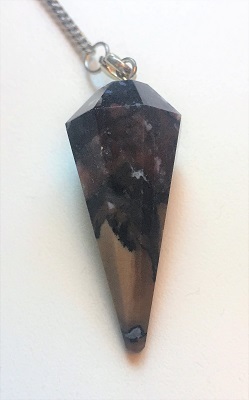 Beautiful mix of brown and black colors Picture Jasper Crystal Pendulum. 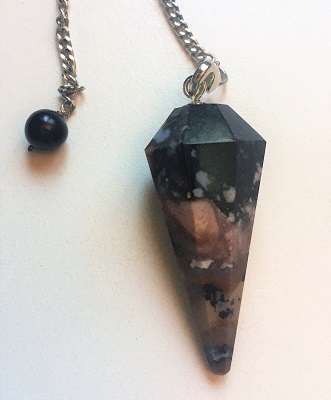 This picture jasper pendulum may be the perfect crystal tool for divination as Picture Jasper is a shamanic stone said to contain messages from the past within its pictures for those who can read it. 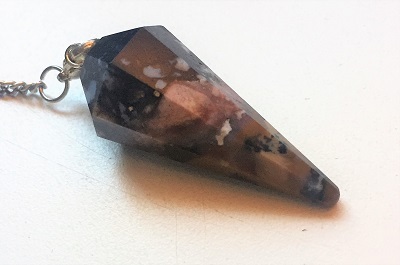 Picture jasper with its nurturing and protective energies provides a deep soul healing and support when dealing with feelings of guilt, envy, hatred, love, and negative thoughts. Picture Jasper is comforting while alleviating feelings of fear. Picture Jasper fosters confidence and determination to all pursuits and brings courage to get to grips with problems. Picture jasper may be helpful for absorbing and recycling negative energies by grounding the energy back into the Earth reestablishing a healthy energy flow. 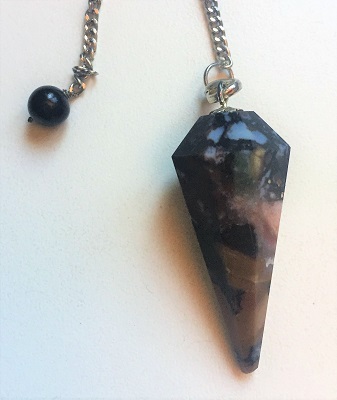 In healing, crystal pendulums may be used in making validating healthy choices and additional clarity with diagnosis and health information. Picture Jasper stimulates the immune system and cleanses the kidneys.